How have turtles lived so long? They appear terminally linear. They get pointed in one direction, THAT WAY, and it’s the ONLY WAY. Hopeless illustrated? 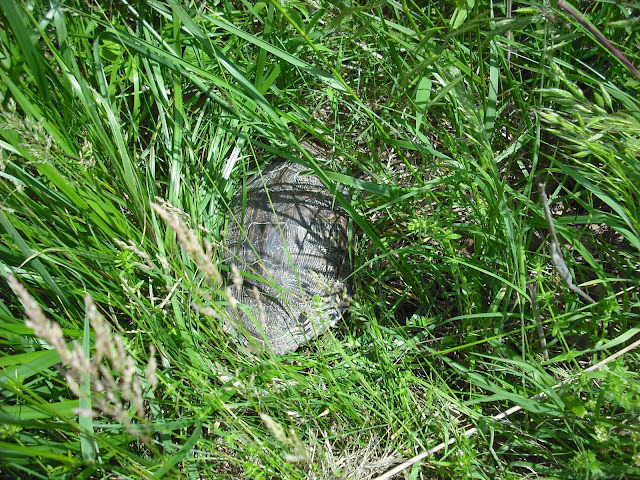 A turtle nosed against a highway median barrier. It’s spring in northeast Oklahoma and turtles are going walkabout. Females are looking for a cozy spot to lay eggs. We all know what males are looking for. If I see imminent doom and can do something to avert it without horrific unintended consequence, I do. 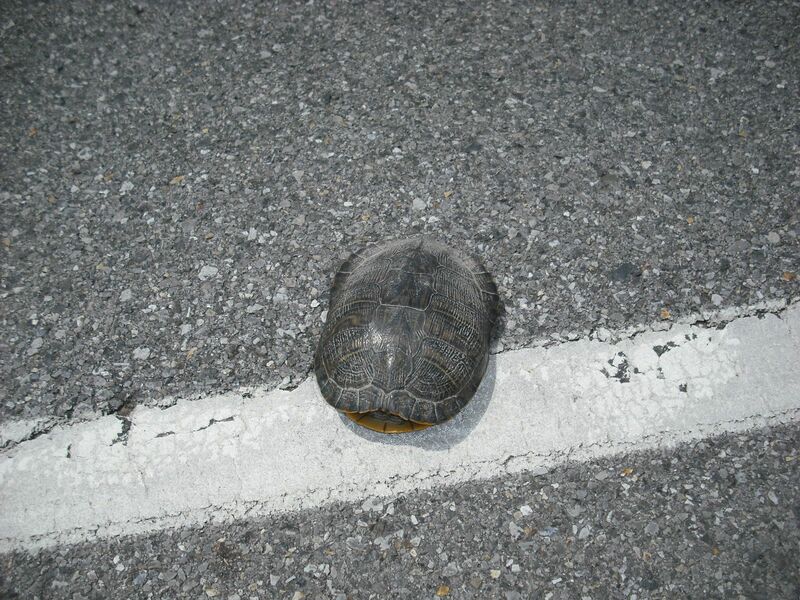 Yesterday I saw a prime red eared-slider on the side of the road, just making the first move to cross. I got turned around, headed back, turned around again to be on the correct side of the highway and parked in someone’s driveway. I got out in time to see the turtle, neck stretched, head up, disappear under a pick up. Nice driver made sure not to hit the jaywalker. I scooped up the turtle (whereupon one of us peed), and took her to the other side of the highway, set her down, nose pointed HER WAY and wished her well. Turtles have been around for 200 million years, and only lately have had to contend with mechanized dangers. They pretty much always take second in close encounters of the highway kind. Most turtles don’t survive the eight years or so it takes to reach breeding age. With exceptional karma, they can live 40 years. The loss of every turtle on the highway is a very bad thing for the species. In the spring turtles wake up from hibernation feeling amorous. They can feel romantic in the fall too. They’re omnivorous, but especially carnivorous when young. 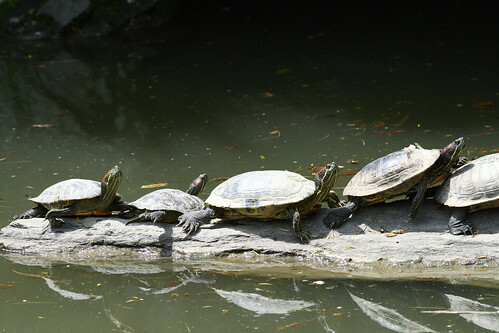 They charmingly bask on logs in chains, the front of one turtle resting on the back end of another turtle and so on. 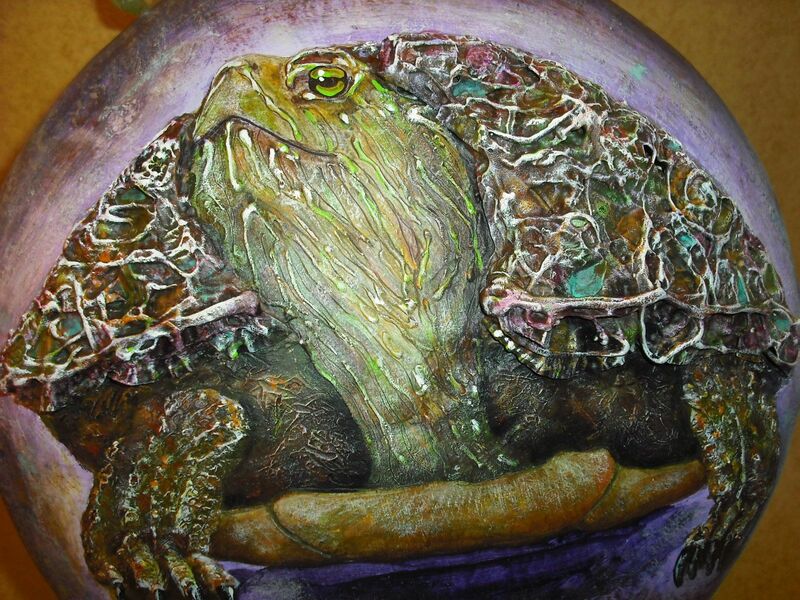 Bottle caps make an artful and evocative turtle shell. I’ve always wondered what was under the shell. It’s one thing to see the wonder of turtle anatomy as feng shui, and entirely different to see 200 million years of evolved perfection wasted on a highway. thank you for this. It is now part of our summer school science class. so cool. Awww … I looooove turtles. I too often reroute them from traffic where possible. One of the most horrifying things I’ve ever seen was along a two-lane country highway … a turtle was desperately trying to crawl from inside a traffic lane to the edge. His head was stretched forward as far as possible, his front legs were trying to pull at the asphalt, but he was not moving. 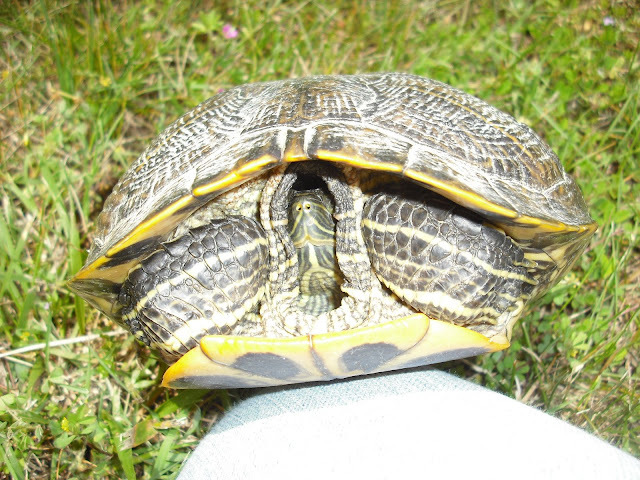 Someone had run over the back half of him, so the back of his shell was crushed and his back legs were useless. Thought of you this morning on my way to work. Flying down the road (as usual) saw a dark little lump in the middle. My head turns …. Wha?! What was THAT?! Was it?! Maybe?! Stomped the brakes. Screeeeeched the tires, slammed er into reverse … careful, careful … don’t want to run over it …. and … yep. A turtle. Startled by me or drivers before me — had all legs inside the house. Fortunately head was peeking out enough for me to determine the direction of travel! Whew! Gently placed him on the grassy roadside at hopefully the precise angle he was traveling. And told him to stay out of the road and to have a good day. Another one saved. FIVE SAVED IN ONE DAY! I knew there was some reason I liked you — as a fellow turtle-helper-across-the-highway I loved “Give Turtles the Right of Way.” It breaks my heart to see them out there on their own. My record, when I was younger and spryer (is that a word?) was five turtles in one day! I’m so glad you’re sharing their challenges with the blogosphere. Who knows how many lives you’re saving! Very much enjoyed the Pale Blue Dot too; may have to revisit that occasionally. It’s a good thing that you share your thoughts with the world! garbage and we marched the turtle over to the local police precinct. Poor turtle. My brother and I were both crying. Hope all is well with you. Hope your Dad is doing ok too..
One of us peed…been there done that. Just try to direct its body away from you if your lucky.